“There’s no strong correlation between interest rates and home prices,” said Douglas Duncan, chief economist at Fannie Mae. However, a key difference now compared to earlier periods, is that there is more investor buying. And investors will compare their returns on different investments - and rising rates will probably slow investor demand for real estate, even if they are all cash buyers. But, in general, I think rising rates might slow price increases but not lead to a decline in prices (we might see some seasonal declines). I'll post some more thoughts on the relationship between house prices and interest rates (long term readers might remember I wrote about this in 2005), but first I'd like to post a couple of graphs. 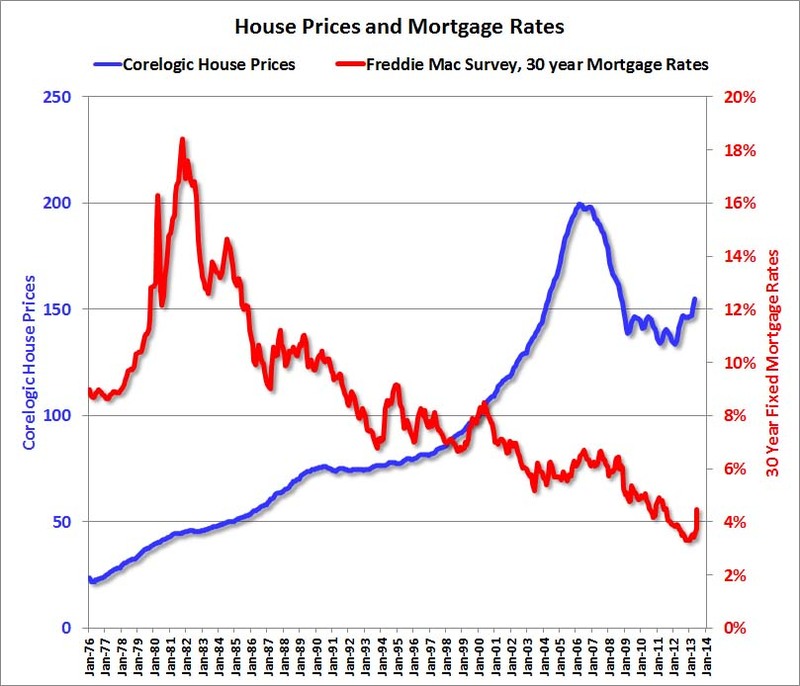 The first graph shows the Corelogic House Price Index (started in 1976) and 30 year fixed mortgage rates as reported by Freddie Mac in their weekly Primary Mortgage Market Survey® . Even with mortgage rates rising sharply in the late '70s, house prices continued to increase. 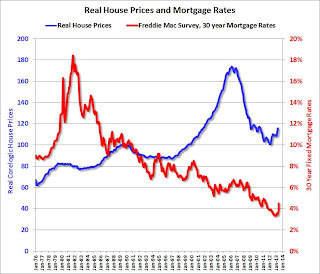 And there were a few spikes in interest rates (like in 2000) that didn't slow price increases. 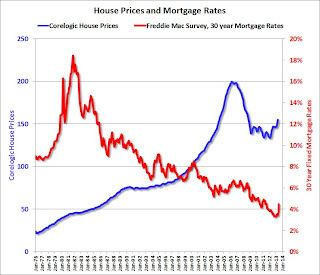 The second graph shows the same data, but with house prices in real terms (adjusted for inflation). 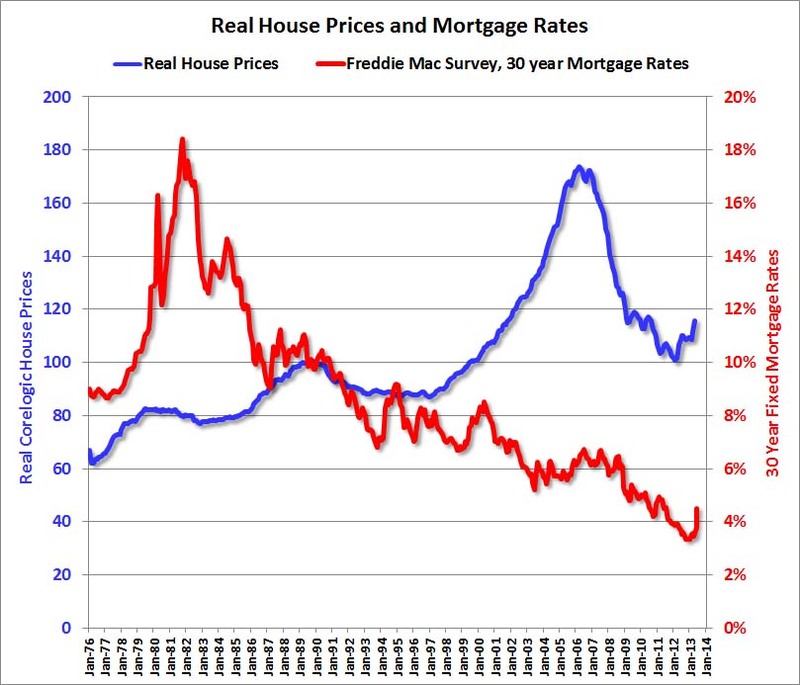 Real prices were fairly flat in the late '70s and early '80s ... so maybe the spike in interest rates slowed price increases ... and then the economic weakness in the early '80s kept prices from rising even as mortgage rates declined. In the early '90s, economic weakness (and the unwinding of a small housing bubble in certain states), lead to falling real prices even as mortgage rates declined. The bottom line is other factors (like a stronger economy) have a bigger impact on house prices than changes in mortgage rates.